Studio Whimzy is owned and operated by Sarah Kathryn Dossett in Oxford, MS. The studio began bringing creative events to our community in 2010. We offer acrylic painting and ceramic workshops for adults. We offer an After-School Art educational program, art camps and birthday parties for kids. Paint and Pals and Lunch Bunch for our Pre Schoolers and a Mom and Me Morning Out program. Bring a school for a field trip or plan your own event! Our Z Events are painting events where we complete an entire masterpiece using step-by-step instruction in one session. We offer a monthly schedule of events and also the opportunity to create your own private event with friends. Our children's program is very important to us at the studio. We work hard to offer several different opportunities for your child on a monthly basis. We focus on the basic concepts of art and strive to give each young artist a solid art foundation that they can carry with them through life. We study the masters and local artist to achieve art appreciation. We are located at 807 College Hill Rd. next to Skymart and across the street from Pat Lamar park in Oxford, MS. Follow us on Facebook and Instagram. Sarah Kathryn Dossett is a Mississippi native that studied art and graduated from the University of Mississippi with a B.F.A. in Printmaking. 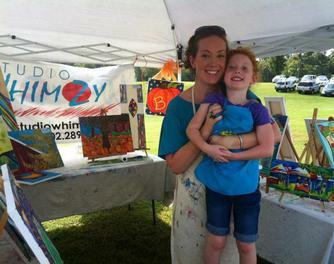 She created Studio Whimzy in 2010 as a way to bring art to all local artist in Oxford, MS. She plans to expand Studio Whimzy in 2016 and offer more mediums to Whimzy artist-including printmaking. She is married to husband, Trey Bridgers, and has three talented children-Elsie James, Tucker and Jack. Sarah Kathryn is also the Double Decker Festival featured artist in 2018. You can find her design on the t-shirts and poster at the 2018 Double Decker Festival and you can also find her at her booth during the event on the square.